Isidore Marie Auguste François Xavier Comte (pronounced [oɡyst kɔ̃t] ( listen); 19 January 1798 – 5 September 1857) was a French philosopher and writer who formulated the doctrine of positivism. He is sometimes regarded as the first philosopher of science in the modern sense of the term. Influenced by the utopian socialist Henri Saint-Simon, Comte developed the positive philosophy in an attempt to remedy the social malaise of the French Revolution, calling for a new social doctrine based on the sciences. Comte was a major influence on 19th-century thought, influencing the work of social thinkers such as Karl Marx, John Stuart Mill, and George Eliot. His concept of sociologie and social evolutionism set the tone for early social theorists and anthropologists such as Harriet Martineau and Herbert Spencer, evolving into modern academic sociology presented by Émile Durkheim as practical and objective social research. Comte's social theories culminated in his "Religion of Humanity", which presaged the development of non-theistic religious humanist and secular humanist organizations in the 19th century. Comte may have coined the word altruisme (altruism). 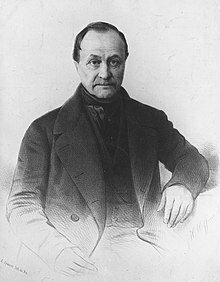 Auguste Comte was born in Montpellier, Hérault on 19 January 1798. After attending the Lycée Joffre and then the University of Montpellier, Comte was admitted to the École Polytechnique in Paris. The École Polytechnique was notable for its adherence to the French ideals of republicanism and progress. The École closed in 1816 for reorganization, however, and Comte continued his studies at the medical school at Montpellier. When the École Polytechnique reopened, he did not request readmission. Following his return to Montpellier, Comte soon came to see unbridgeable differences with his Catholic and monarchist family and set off again for Paris, earning money by small jobs. In August 1817 he found an apartment at 36 rue Bonaparte in Paris' 6ème (where he lived until 1822) and later that year he became a student and secretary to Henri de Saint-Simon, who brought Comte into contact with intellectual society and greatly influenced his thought therefrom. During that time Comte published his first essays in the various publications headed by Saint-Simon, L'Industrie, Le Politique, and L'Organisateur (Charles Dunoyer and Charles Comte's Le Censeur Européen), although he would not publish under his own name until 1819's "La séparation générale entre les opinions et les désirs" ("The general separation of opinions and desires"). In 1824, Comte left Saint-Simon, again because of unbridgeable differences. Comte published a Plan de travaux scientifiques nécessaires pour réorganiser la société (1822) (Plan of scientific studies necessary for the reorganization of society). But he failed to get an academic post. His day-to-day life depended on sponsors and financial help from friends. Debates rage as to how much Comte appropriated the work of Saint-Simon. Comte married Caroline Massin in 1825. In 1826, he was taken to a mental health hospital, but left without being cured – only stabilized by French alienist Jean-Étienne Dominique Esquirol – so that he could work again on his plan (he would later attempt suicide in 1827 by jumping off the Pont des Arts). In the time between this and their divorce in 1842, he published the six volumes of his Cours. Comte developed a close friendship with John Stuart Mill. From 1844, he fell deeply in love with the Catholic Clotilde de Vaux, although because she was not divorced from her first husband, their love was never consummated. After her death in 1846 this love became quasi-religious, and Comte, working closely with Mill (who was refining his own such system) developed a new "Religion of Humanity". John Kells Ingram, an adherent of Comte, visited him in Paris in 1855. He published four volumes of Système de politique positive (1851–1854). His final work, the first volume of La Synthèse Subjective ("The Subjective Synthesis"), was published in 1856. Comte died in Paris on 5 September 1857 from stomach cancer and was buried in the famous Père Lachaise Cemetery, surrounded by cenotaphs in memory of his mother, Rosalie Boyer, and of Clotilde de Vaux. His apartment from 1841–1857 is now conserved as the Maison d'Auguste Comte and is located at 10 rue Monsieur-le-Prince, in Paris' 6th arrondissement. Comte first described the epistemological perspective of positivism in The Course in Positive Philosophy, a series of texts published between 1830 and 1842. These texts were followed by the 1848 work, A General View of Positivism (published in English in 1865). The first three volumes of the Course dealt chiefly with the physical sciences already in existence (mathematics, astronomy, physics, chemistry, biology), whereas the latter two emphasised the inevitable coming of social science. Observing the circular dependence of theory and observation in science, and classifying the sciences in this way, Comte may be regarded as the first philosopher of science in the modern sense of the term. Comte was also the first to distinguish natural philosophy from science explicitly. For him, the physical sciences had necessarily to arrive first, before humanity could adequately channel its efforts into the most challenging and complex "Queen science" of human society itself. His work View of Positivism would therefore set out to define, in more detail, the empirical goals of sociological method. Comte offered an account of social evolution, proposing that society undergoes three phases in its quest for the truth according to a general 'law of three stages'. Comte's stages were (1) the theological stage, (2) the metaphysical stage, and (3) the positive stage. (1) The Theological stage was seen from the perspective of 19th century France as preceding the Age of Enlightenment, in which man's place in society and society's restrictions upon man were referenced to God. Man blindly believed in whatever he was taught by his ancestors. He believed in a supernatural power. Fetishism played a significant role during this time. (2) By the "Metaphysical" stage, Comte referred not to the Metaphysics of Aristotle or other ancient Greek philosophers. Rather, the idea was rooted in the problems of French society subsequent to the French Revolution of 1789. This Metaphysical stage involved the justification of universal rights as being on a vauntedly higher plane than the authority of any human ruler to countermand, although said rights were not referenced to the sacred beyond mere metaphor. This stage is known as the stage of investigation, because people started reasoning and questioning, although no solid evidence was laid. The stage of investigation was the beginning of a world that questioned authority and religion. (3) In the Scientific stage, which came into being after the failure of the revolution and of Napoleon, people could find solutions to social problems and bring them into force despite the proclamations of human rights or prophecy of the will of God. Science started to answer questions in full stretch. In this regard he was similar to Karl Marx and Jeremy Bentham. For its time, this idea of a Scientific stage was considered up-to-date, although from a later standpoint, it is too derivative of classical physics and academic history. Comte's law of three stages was one of the first theories of social evolutionism. Comte's Theory of Science – According to Comte, the whole of the sciences consists of theoretical and applied knowledge. Theoretical knowledge can generally be divided into physics and biology, which are the object of his research and can be further partitioned into subfields such as botany, zoology or mineralogy. 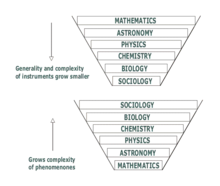 Comte's ranking of scientific fields - in order, mathematics, astronomy, physics, chemistry, biology and sociology - symbolizes a decreasing range of research and complexity of theoretical tools, but a growing complexity of the phenomena under investigation. Each field in this ranking depends upon those that came before it; for instance, our understanding of chemistry depends upon our understanding of physics, as all chemical phenomena are more complicated than the physics that underlie them, and although the laws of chemistry are affected by the laws of physics, the converse is not true. Similarly, sciences that appear earlier in Comte's hierarchy are considered to be older and more advanced than those which come later. The other universal law he called the "encyclopedic law". By combining these laws, Comte developed a systematic and hierarchical classification of all sciences, including inorganic physics (astronomy, earth science and chemistry) and organic physics (biology and, for the first time, physique sociale, later renamed sociologie). Independently from Emmanuel Joseph Sieyès's introduction of the term in 1780, Comte re-invented "sociologie", and introduced the term as a neologism, in 1838. Comte had earlier used the term "social physics", but that term had been appropriated by others, notably by Adolphe Quetelet. The most important thing to determine was the natural order in which the sciences stand — not how they can be made to stand, but how they must stand, irrespective of the wishes of any one....This Comte accomplished by taking as the criterion of the position of each the degree of what he called "positivity", which is simply the degree to which the phenomena can be exactly determined. This, as may be readily seen, is also a measure of their relative complexity, since the exactness of a science is in inverse proportion to its complexity. The degree of exactness or positivity is, moreover, that to which it can be subjected to mathematical demonstration, and therefore mathematics, which is not itself a concrete science, is the general gauge by which the position of every science is to be determined. Generalizing thus, Comte found that there were five great groups of phenomena of equal classificatory value but of successively decreasing positivity. To these he gave the names: astronomy, physics, chemistry, biology, and sociology. This idea of a special science (not the humanities, not metaphysics) for the social was prominent in the 19th century and not unique to Comte. It has recently been discovered that the term "sociology" (as a term considered coined by Comte) had already been introduced in 1780, albeit with a different meaning, by the French essayist Emmanuel Joseph Sieyès (1748–1836). The ambitious (or many would say 'grandiose') way that Comte conceived of this special science of the social, however, was unique. Comte saw this new science, sociology, as the last and greatest of all sciences, one which would include all other sciences and integrate and relate their findings into a cohesive whole. It has to be pointed out, however, that he noted a seventh science, one even greater than sociology. Namely, Comte considered "Anthropology, or true science of Man [to be] the last gradation in the Grand Hierarchy of Abstract Science." 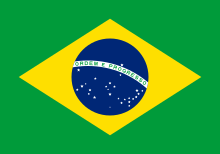 The motto Ordem e Progresso ("Order and Progress") in the flag of Brazil is inspired by Auguste Comte's motto of positivism: L'amour pour principe et l'ordre pour base; le progrès pour but ("Love as a principle and order as the basis; Progress as the goal"). Several of those involved in the military coup d'état that deposed the Empire of Brazil and proclaimed Brazil to be a republic were followers of the ideas of Comte. Comte's explanation of the Positive philosophy introduced the important relationship between theory, practice and human understanding of the world. On page 27 of the 1855 printing of Harriet Martineau's translation of The Positive Philosophy of Auguste Comte, we see his observation that, "If it is true that every theory must be based upon observed facts, it is equally true that facts can not be observed without the guidance of some theories. Without such guidance, our facts would be desultory and fruitless; we could not retain them: for the most part we could not even perceive them." Comte's emphasis on the interconnectedness of social elements was a forerunner of modern functionalism. Nevertheless, as with many others of Comte's time, certain elements of his work are now viewed as eccentric and unscientific, and his grand vision of sociology as the centerpiece of all the sciences has not come to fruition. His emphasis on a quantitative, mathematical basis for decision-making remains with us today. It is a foundation of the modern notion of Positivism, modern quantitative statistical analysis, and business decision-making. His description of the continuing cyclical relationship between theory and practice is seen in modern business systems of Total Quality Management (TQM) and Continuous Quality Improvement where advocates describe a continuous cycle of theory and practice through the four-part cycle of Plan-Do-Check-Act (PDCA, the Shewhart cycle). Despite his advocacy of quantitative analysis, Comte saw a limit in its ability to help explain social phenomena. The early sociology of Herbert Spencer came about broadly as a reaction to Comte; writing after various developments in evolutionary biology, Spencer attempted to reformulate the discipline in what we might now describe as socially Darwinistic terms. Comte's fame today owes in part to Émile Littré, who founded The Positivist Review in 1867. Debates continue to rage, however, as to how much Comte appropriated from the work of his mentor, Henri de Saint-Simon. Comte influenced the Young Turks political movement. In later years, Comte developed the 'religion of humanity' for positivist societies in order to fulfil the cohesive function once held by traditional worship. In 1849, he proposed a calendar reform called the 'positivist calendar'. For close associate John Stuart Mill, it was possible to distinguish between a "good Comte" (the author of the Course in Positive Philosophy) and a "bad Comte" (the author of the secular-religious system). The system was unsuccessful but met with the publication of Darwin's On the Origin of Species (1859) to influence the proliferation of various Secular Humanist organizations in the 19th century, especially through the work of secularists such as George Holyoake and Richard Congreve. Although Comte's English followers, including George Eliot and Harriet Martineau, for the most part rejected the full gloomy panoply of his system, they liked the idea of a religion of humanity and his injunction to "vivre pour autrui" ("live for others"), from which comes the word "altruism". Comte was agitated by the fact that no one had synthesized physics, chemistry, and biology into a coherent system of ideas, so he began an attempt to reasonably deduce facts about the social world from the use of the sciences. Through his studies, he concluded that the growth of the human mind progresses in stages, and so must societies. He claimed the history of society could be divided into three different stages: theological, metaphysical, and positive. The Law of three Stages, an evolutionary theory, describes how history of societies is split into three sections due to new thoughts on philosophy. Comte believed that evolution was the growth of the human mind, splitting into stages and evolving through these stages. Comte concluded that society acts similarly to the mind. The law is this: that each of our leading conceptions – each branch of our knowledge – passes successively through three different theoretical conditions: the Theological, or fictitious; the Metaphysical, or abstract; and the Scientific, or positive. The Law of Three Stages is the evolution of society in which the stages have already occurred or are currently developing. The reason why there are newly developed stages after a certain time period is that the system "has lost its power" and is preventing the progression of civilization, causing complicated situations in society. 10. The only way to escape the situation is for people within the civilized nations to turn towards an "organic" new social system. Comte refers to kings to show the complications of re-establishment on society. Kings feel the need to reorganize their kingdom, but many fail to succeed because they do not consider that the progress of civilization needs reform, not perceiving that there is nothing more perfect than inserting a new, more harmonious system. Kings fail to see the effectiveness of abandoning old systems because they do not understand the nature of the present crisis. But in order to progress, there needs to be the necessary consequences that come with it, which is caused by a "series of modifications, independent of the human will, to which all classes of society contributed, and of which kings themselves have often been the first agents and most eager promoters". The people themselves have the ability to produce a new system. This pattern is shown through the theological stage, metaphysical stage, and positive stage. The first stage, the theological stage, relies on supernatural or religious explanations of the phenomena of human behavior because "the human mind, in its search for the primary and final causes of phenomena, explains the apparent anomalies in the universe as interventions of supernatural agents". The Theological Stage is the "necessary starting point of human intelligence", when humans turn to supernatural agents as the cause of all phenomena. In this stage, humans focus on discovering absolute knowledge. Comte disapproved this stage because it turned to simple explanation humans created in their minds that all phenomena was caused by supernatural agents, rather than human reason and experience. Comte refers to Bacon's philosophy that "there can be no real knowledge except that which rests upon observed facts", but he observes that the primitive mind could not have thought that way because it would have only created a vicious circle between observations and theories. "For if, on the one hand, every positive theory must necessarily be founded upon observations, it is, on the other hand, no less true that, in order to observe, our mind has need of some theory or other". Because the human mind could not have thought in that way in the origin of human knowledge, Comte claims that humans would have been "incapable of remembering facts", and would not have escaped the circle if it were not for theological conceptions, which were less complicated explanations to human life. Although Comte disliked this stage, he explains that theology was necessary in the beginning of the developing primitive mind. The second stage, the metaphysical stage, is merely a modification of the first because a supernatural cause is replaced by an "abstract entity"; it is meant to be a transitional stage, where there is the belief that abstract forces control the behavior of human beings. Because it is a transitional stage between the theological stage and the positive stage, Comte deemed it the least important of the three stages and was only necessary because the human mind cannot make the jump from the theological to the positive stage on its own. The metaphysical stage is the transitional stage. Because "Theology and physics are so profoundly incompatible", and their "conceptions are so radically opposed in character", human intelligence must have a gradual transition. Other than this, Comte says that there is no other use for this stage. Although it is the least important stage, it is necessary because humans could not handle the significant change in thought from theological to positivity. The metaphysical stage is just a slight modification of the previous stage, when people believed in the abstract forces rather than the supernatural. The mind begins to notice the facts themselves, caused by the emptiness of the metaphysical agents through "over subtle qualification that all right-minded persons considered them to be only the abstract names of the phenomena in question". The mind becomes familiar with concepts, wanting to seek more, and therefore is prepared to move into the positive stage. The last stage – the positive stage – is when the mind stops searching for the cause of phenomena and realizes that laws exist to govern human behavior, and that this stage can be explained rationally with the use of reason and observation, both of which are used to study the social world. This stage relies on science, rational thought, and empirical laws. Comte believed that this study of sociology he created was "the science that [came] after all the others; and as the final science, it must assume the task of coordinating the development of the whole of knowledge" because it organized all of human behavior. The final, most evolved stage is the positivist stage, the stage when humans give up on discovering absolute truth, and turn towards discovering, through reasoning and observation, actual laws of phenomena. Humans realize that laws exist, and that the world can be rationally explained through science, rational thought, laws, and observation. Comte was a positivist, believing in the natural rather than the supernatural, and so he claimed that his time period, the 1800s, was in the positivist stage. He believed that within this stage, there is a hierarchy of sciences: mathematics, astronomy, terrestrial physics, chemistry, and physiology. Mathematics, the "science that relates to the measurement of magnitudes", is the most perfect science of all, and is applied to the most important laws of the universe. Astronomy is the most simple science, and is the first "to be subjected to positive theories". Physics is less satisfactory than astronomy, because it is more complex, having less pure and systemized theories. Physics, as well as chemistry, are the "general laws of the inorganic world", and are harder to distinguish. Physiology completes the system of natural sciences, and is the most important of all sciences because it is the "only solid basis of the social reorganization that must terminate the crisis in which the most civilized nations have found themselves". This stage will fix the problems in current nations, allowing progression and peace. Auguste Comte is well known for writing in his book "The Positive Philosophy" that people would never learn the chemical composition of the planets. This has been called a very poor prediction regarding human limits in science. In thirty years people were beginning to learn the composition of planets through spectroscopy. When Ernest Renan published his Essais philosophiques, he clearly stated in their preface that all of them were the result of dialogues between his friend Comte and him, with an impossibility to remember who of them said, developed or modified what. ^ a b Pickering (2006), p. 192ff. ^ Pickering (2009b), pp. 216 and 304. Chisholm, Hugh, ed. (1911). "Comte, Auguste" . Encyclopædia Britannica. 6 (11th ed.). Cambridge University Press. pp. 814–822. ^ "Auguste Comte". The Stanford Encyclopedia of Philosophy. Metaphysics Research Lab, Stanford University. 2018. ^ "altruism (n .)". Online Etymology Dictionary. Retrieved 21 August 2013. ^ a b "Auguste Comte". Stanford Encyclopaedia: Auguste Comte. plato.stanford.edu. Metaphysics Research Lab, Stanford University. 2018. ^ Des Manuscrits de Sieyès. 1773–1799, Volumes I and II, published by Christine Fauré, Jacques Guilhaumou, Jacques Vallier et Françoise Weil, Paris, Champion, 1999 and 2007. See also Jacques Guilhaumou, Sieyès et le non-dit de la sociologie: du mot à la chose, in Revue d'histoire des sciences humaines, Number 15, November 2006. Naissances de la science sociale. ^ 1874 translation of System of Positive Polity, Vol. II, pages 356–347, cited in Urbanowicz, Charles F. 1992. "Four-Field Commentary". Anthropology Newsletter. Volume 33, Number 9, page 3. ^ Hanioglu, M. Sukru (1995). "Ch. 9: The Political Ideas of the Young Turks". The Young Turks in Opposition. Oxford University Press. pp. 200-212. ^ a b Delaney, Tim. "Auguste Comte". Council for Secular Humanism. Council for Secular Humanism, Oct.-Nov. 2003. ^ From The Positive Philosophy of Auguste Comte (trans. Harriet Martineau; London, 1853), Vol. I, p. 1. ^ a b c d e f Comte, Auguste, and Gertrud Lenzer. Auguste Comte and Positivism: The Essential Writings. New York: Harper & Row, 1975. Print. ^ a b c Bourdeau, Michel. Auguste Comte. Stanford University. http://plato.stanford.edu/entries/comte/ [April 28, 2016]. ^ a b c d e f g "Auguste Comte." Columbia Electronic Encyclopedia, 6Th Edition (2015): 1. MAS Ultra School Edition. Web. ^ a b Delaney, Tim. Auguste Comte. Council for Secular Humanism, 2003. ^ How do we know the composition of stars? Mary Pickering, Auguste Comte, Volume 1: An Intellectual Biography, Cambridge University Press (1993), Paperback, 2006. Mary Pickering, Auguste Comte, Volume 2: An Intellectual Biography, Cambridge University Press, 2009a. Mary Pickering, Auguste Comte, Volume 3: An Intellectual Biography, Cambridge University Press, 2009b. Oséias Faustino Valentim, O Brasil e o Positivismo, Publit, Rio de Janeiro, 2010. ISBN 978-85-7773-331-6. Jean-François Eugène Robinet, Notice sur l'oeuvre et sur la vie d'Auguste Comte, par le Dr Robinet, son médecin et l'un de ses treize exécuteurs testamentaires, Paris : au siège de la Société positiviste, 1891. 3e éd. Jean-François Eugène Robinet, La philosophie positive: Auguste Comte et M. Pierre Laffitte, Paris : G. Baillière, [ca 1881]. Henri Gouhier, "Final Chapter – Life in the anticipation of the Grave", from The Life of Auguste Comte (1931). On Comte's last years, practicing his own religion.